When we left the Tibetan Homestay we had about an hour walk down to the bottom of the mountain to meet Andrew for our trip to Songpan. Gemma had such a fabulous time with the kids that she cried half way down the mountain begging me to leave her there. When we finally arrived at the bottom of the mountain Andrew was waiting for us and we loaded up and went on our way. On the way to Songpan we stopped to look at an old monastery. Gemma wanted to wait in the car while we took a few pictures. 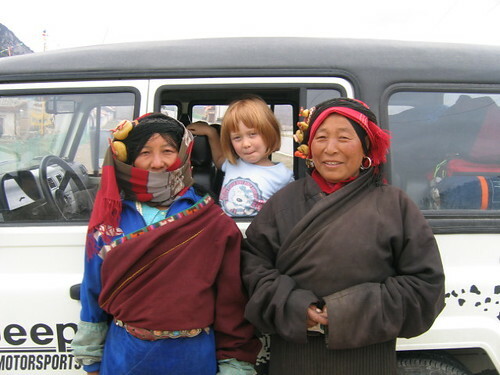 Two Tibetan women approached the car, so Andrew started to talk to them. They were very intrigued by little Miss Red Head, so we got a few snapshots of Gemma with her new friends. 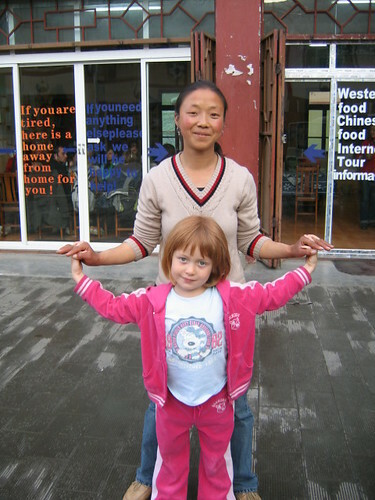 Gemma and the two beautiful Tibetan women. We arrived in Songpan and went to a little Western hangout called Emma's Kitchen owned by Andrew's friend Emma. Gemma and Emma immediately became great friends. 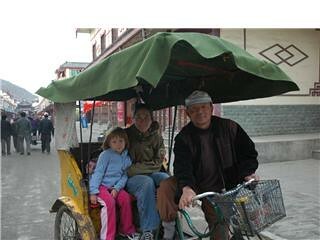 Gemma and I took a little rickshaw ride around the town. Songpan is known for horse trekking, so we decided to go on a short two hour trek on our last day. The evening before was extremely chilly, so we thought we may need heavier coats for horse trekking. 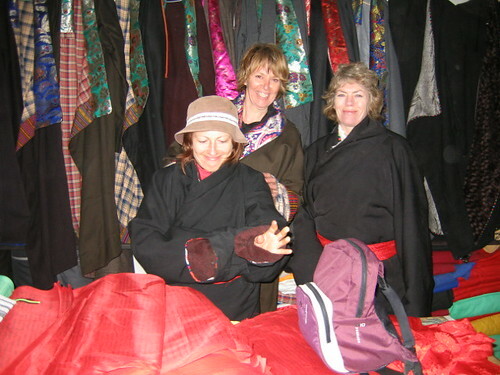 Andrew suggested we buy Tibetan coats for our trek. Here is Penny, Leslie, and Hillary trying on the coats. I found both Gemma and Angus gorgeous coats for about $13. 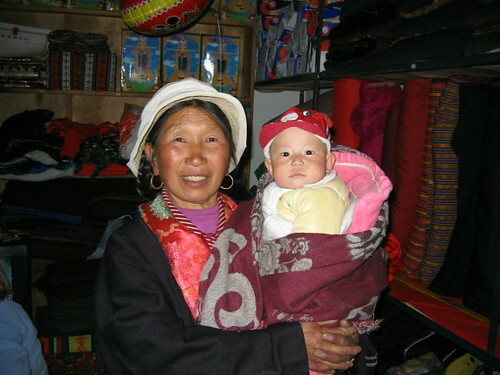 Here is a gorgeous little baby with her Grandmother. The next day we mounted our horse and headed out for our horse trekking. I was a little hesitant about going with Gemma because she is only 5. I checked out the horse and they seemed quite calm and seemed to walk quite slowly. I asked if I could ride with Gemma for a while until she got the hang of it and they agreed. We brought my horse just in case we decided to ride separately later. Here we are getting prepared for our ride. 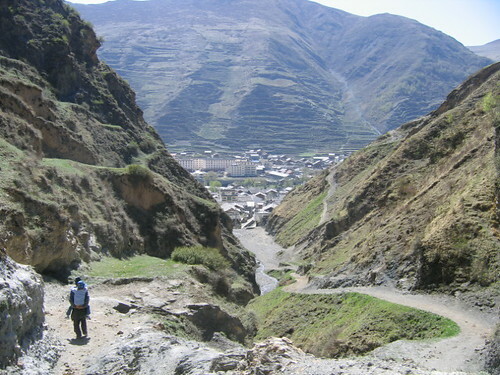 We headed for the mountain and most of us about fell off our horses when we saw how steep and narrow our path was. Hillary decided to go back, but the rest of us continued on. About 15 minutes into our ride we were all getting a bit hot, so we took off our coats. 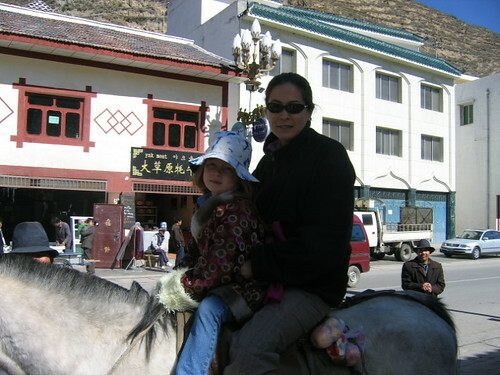 Our guide put the reigns of our horse down and took Gemma off the horse to take her coat off. I proceed to take my coat off on the horse and there seemed to be no problem. Our guide put Gemma back on the horse and then for some reason our horse decided to turn around. Another guide went to bring him back around when the horse started to buck. Gemma started to fall off and I pulled her back up. The horse bucked again and threw me on my back and Gemma on her bottom. As we lay on the ground the horse reared again and I just shut my eyes and hoped for the best. Luckily we were a little scared and bruised. Gemma, Leslie and I decided we were done for the day and walked down the mountain. The guide felt so bad he carried Gemma the entire way back to the horse trekking office. 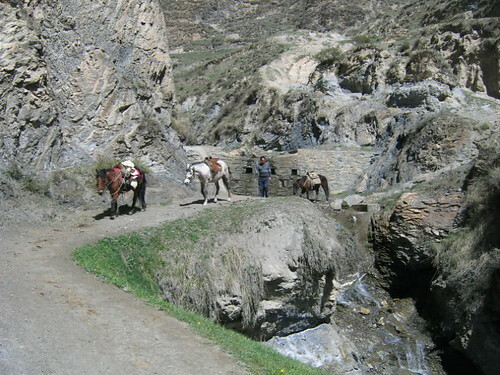 Here are our horses coming back from the mountain. Notice the narrow path. The rest of the day we decided to relax at Emma's Kitchen and do a bit more shopping. 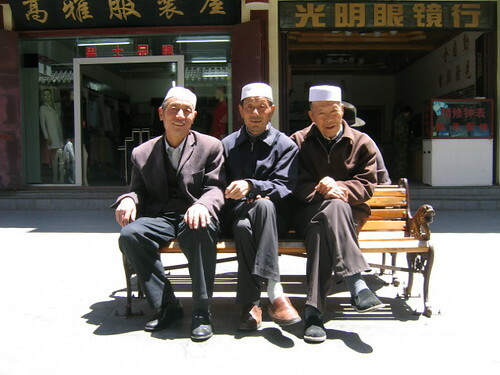 I saw these three Uighur men sitting in the sunshine and thought it was a great photo. Uighurs are Muslim and from the Northwest Province of Xinjiang. We have been collecting dress-up clothes for Gemma while we have been living in China. 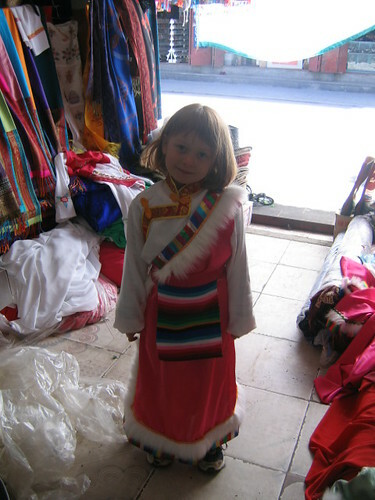 She has a traditional Chinese qipao, a Qiang minority outfit and now she has this gorgeous Tibetan dress. Our trip was a success and we loved the area so much we plan on taking Jonny's parents up to visit in August. What an amazing adventure you and Gemma have shared, neither of you will forgot it quickly!